Product Manuals Lost your manuals? Worried About a Flat Tire with No Spare Tire? No Problem! Changing a flat tire is hard to do, takes lots of time and sometimes isn&apos;t an option (many vehicles don&apos;t offer a spare tire any longer). 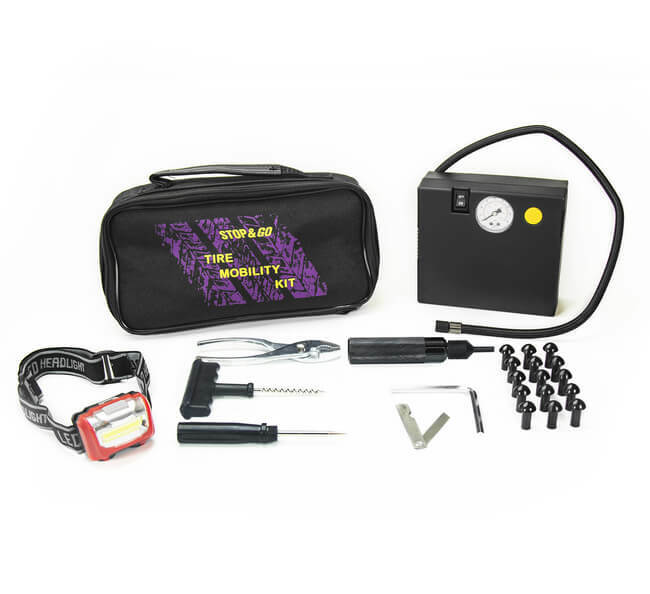 Stop & Go designed the Tire Mobility Kit for Cars to fix a flat tire in just minutes. Works with cars, trucks, trailers, SUV's and RV's! "The second day into my 8-day vacation I noticed a piece of metal, in my brand new Bridgestone tire, that was about an 1/8 of an inch in diameter. The tire at that point had about 800 miles on it. Your Stop and Go kit along with a portable air compressor worked flawlessly. The instruction manual says no faster than 50 MPH and no more than 100 miles on a plugged tire. I exceeded both. I checked the pressure every day and constantly monitored the motorcycle for even a hint of pressure loss in the rear tire. 1700+ miles later it still is holding air. Thanks very much for an excellent product." What makes the Tire Plugger the best tire repair product on the market is our mushroom plug. The plug shaft expands under pressure to fill the puncture and the mushroom head of the plug seats on the inner wall allowing no air to escape. Find the right tire plugger that works for you. Choose from our classic Standard Model, our compact Pocket Tire Plugger or from one of our special packaged kits such as the Tubeless Puncture Pilot. It was universally agreed that the Stop & Go Tire Plugger was the best all-around tire repair in the group. It repaired every hole we could throw at it and the design of the plug just makes good sense." "If there's a single standout product in this round-up of tire repair products, it has to be the Pocket Tire Plugger for tubeless tires from Stop & Go. There's hardly any excuse left for getting stranded by the side of the road with a flat tire and no repair kit." "The only product that I ever bought that worked as simply and as efficiently as claimed. The best money I ever spent."